You may have noticed our Best RV\Caravan Blog 2009 Finalist Award at the top of the left column of the blog. 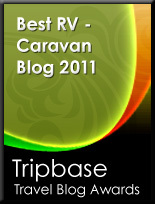 We received an email from TripBase.com informing us that we had received one of the 10 Finalist Awards in the 2009 Best RV\Caravan Blog Category. We don’t know how they found us, but considering that there are 1,000s of RV Blogs we are both surprised and honored to be given the award. Our 11 days here in Kalispell is coming to an end tomorrow when we move on to the town of West Glacier and Glacier National Park. By Montana standards Kalispell is a “big” town and a real “working” town with all of the usual big box stores and fast food franchises, as you would expecting in any big American town.The downtown area has court buildings and office buildings, etc. While here we not only did the usual groceries and laundry things, but also had the truck serviced. We also found time to visit the two Microbrews in town. The best of the two being McKenzie River Pizza Company and their very own McKenzie River Beer. On July 10th we celebrated our 38th wedding anniversary, at a restaurant recommended by fellow Montana Owners here in the park! We also found time to visit Whitefish, Montana about 20 miles north of here. Whitefish is a “tourist” town, its downtown area is galleries, jewelry stores and “trinket” stores. There are no big box stores or fast food franchises. It appears to be a big ski resort area in the winter. A lot of this week has been about meeting interesting people. We met our neighbors to one side, Ray and Dianne from Brooks, Alberta, who have been coming here for the past three years to spend 4th of July in Kalispell. We exchanged cards and are looking forward to meeting up with them again in Quartzsite next January. We met our neighbors on the other side from Cardston, Alberta camping here as an extended family with 5 rigs and at least 8 kids. It was a real grandparents, aunts, uncles, nieces and nephews kind of gathering. Raider in his role as “comfort” dog for all of the people who had to leave their dogs behind while on vacation was a real hit! A Good Sam Chapter from Portland arrived with a dozen rigs as a stop on their 3 week tour of Montana and Idaho. 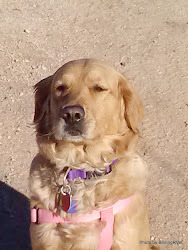 One of their group Carol not only had to see Raider for her “Golden Retriever fix”, since her golden was back at home, but she was also involved with Golden Retriever Rescue in the Portland area. She was interested in Raider rescue story. Carol was also a novice beader, so she and Kathy spent some time discussing beading and beading techniques. We had an interesting experience meeting Chris and Sharon. We got an email to the blog site from someone that said they had Googled "birding and Kalispell" and found our blog. Their message said, "It looks like your picture was taken at Spruce River RV Park, if you are still here we are in site 26." As it so happens, we are in site 29, so they are only a few sites down from us. We went down to introduce ourselves and spend the next 2 hours talking about birding and RVing. Unfortunately they were heading back home the next day, but we are looking forward to seeing them again in Arizona next winter. We probably don’t mention it as often as we should, but everywhere we go the world of RVers is full of friendly and interesting people. No new photos or slideshow for this posting, but check back again for our visit to the very photogenic Glacier National Park. I am living for the day we will be traveling around like you two. Hopefully we will meetup together someday! How cool is that...becoming a finalist in the RV blog world??? Kudos to you and Grant!!! I would definitely vote for you! Lov'n all that extra attention. Congrats on the well-deserved award!! !